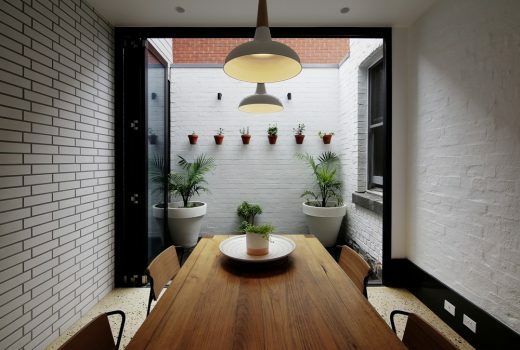 Quarry House is a renovation and addition to an existing Victorian terrace in Brunswick East. 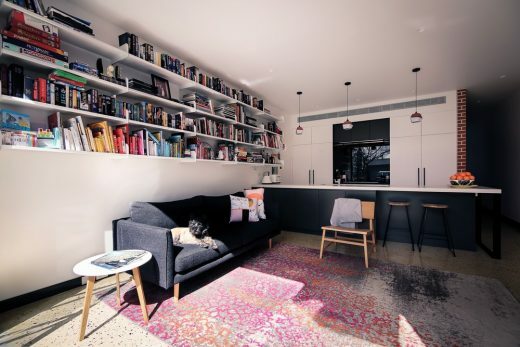 The clients are a young family who had outgrown their tiny two bedroom terrace house. 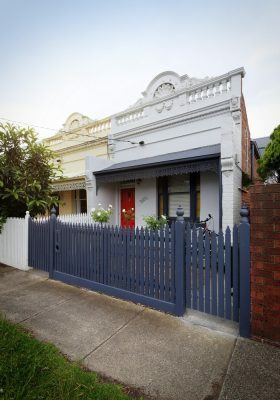 Although liveable, the existing house was in disrepair and lacked a connection to the north facing rear yard. The addition addresses this by locating the most inhabited parts of the house at the rear, with large glass doors opening onto the back yard. 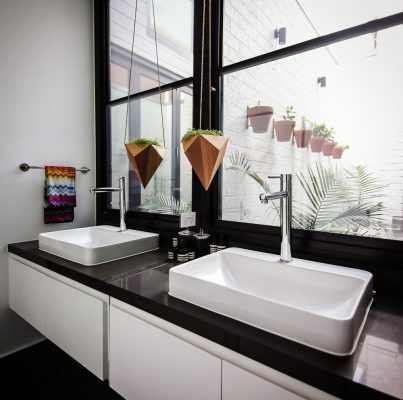 The bathrooms have been located centrally and take advantage of a generous light well at the junction of new and old construction. 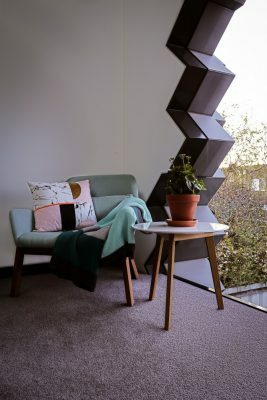 The design of the addition was intended to complement the existing Victorian terrace, while also weaving some of the area’s local history into the built fabric. 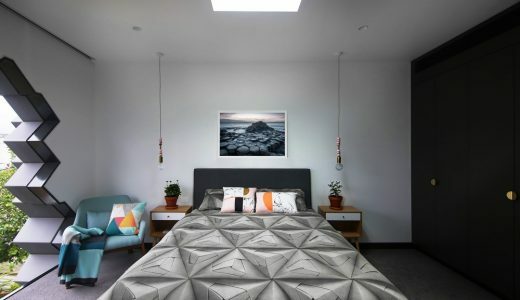 The design takes its cues from the history of the local area, with particular reference to the brick and bluestone quarrying industries upon which Brunswick was founded. The built form is conceived of as two stacked boxes; the ground floor brick box and the upper storey bluestone box. 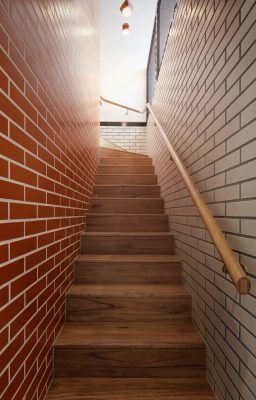 The existing house was constructed almost entirely of brickwork and the ground floor addition remains faithful to this material. The upper floor recalls the local bluestone industry through a figurative representation of naturally occurring bluestone formations. 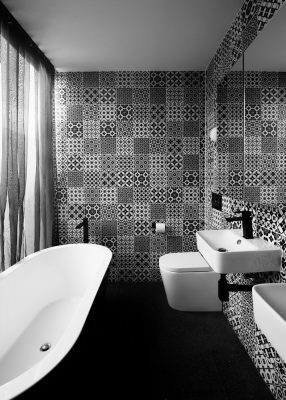 These tessellated patterns are formed when basaltic lava flows cool to create bluestone, cracking and shearing in geometric arrangements. The upper storey is clad in folded zinc panels which recall columnar basalt, eroded at the rear facade to provide an arched, cave-like outline to the new master bedroom window. The cantilevered form also shades the building’s interior during summer and encourages the entry of low sun in winter. By arranging the second storey mass at the rear, north facing end of the house, we have also limited the visibility of the addition behind the historical Victorian facade. The internal planning has been arranged to afford each room with the best access to daylight, with a centrally located courtyard delivering light deep into the plan and also acting as an extension to the dining room. 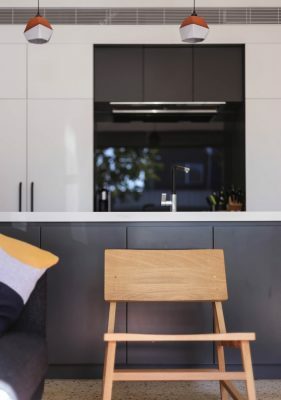 A robust material palette has been used for the interiors with a particular focus on durable finishes and also on fixtures sourced from small, independent designers. One of the biggest challenges on the project was to find a facade contractor who was willing to take on the job of creating the complex geometry at the rear of the house. We had a number of zinc installers who pulled out of the project late in the piece, which mean re-thinking the construction methodology. We worked with a composite panel installer to come up with a suitable system, which meant shop drawing 38 unique panel types which were then cad/cam routed and cut then folded off site and installed over a laser cut plywood substrate. The builder was 2iC Construction, the facade contractor was WS Images, the structural engineer was Maurice Farrugia and Associates. 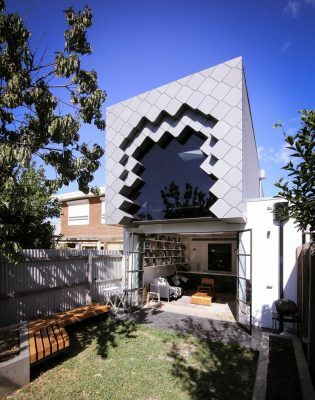 Hook Turn Architecture is a boutique residential architecture practice operating in the inner north of Melbourne. The practice aims to apply rigorous design thinking and problem solving skills to arrive at unique and architecturally unexpected outcomes. We love working on challenging projects and with clients who are open to left-field solutions to complex problems. We believe that sustainability is an integral part of the design process and we strive to create spaces that people love to live in.